Blueprint Promotions-It seems like only yesterday that the Jamaican audience ushered in singer, Romain Virgo as the 2007 winner of the Digicel Rising Stars competition. Yet, in just under three years Romain has released a surge of hits including Caan Sleep, Wanna Go Home, Love Doctor, This Love, Murderer, Who Feels It Knows It and more. Further enhancing his catalogue of songs, the singer recently released two more singles on the Stagalag Riddim produced by Shane Brown on the Jukeboxx label called Ghetto and the other, Memories. Ghetto depicts life in the ghetto, but denounces crime as a way out while Memories features a medley of love songs previously made popular by Sanchez, namely One In A Million, Memories, Brown Eye Girl and others. Regarding Memories, Romain says, "Love songs are great so I was excited about recording a medley of those songs because those were songs I listened to while growing up and to get the chance to put my own spin on them was a great opportunity. And with Ghetto, that's something I feel strongly about. I come from a humble background as everyone knows and I want people listening to know that doing a crime isn't the way out. Use your skills and it will lead you to greatness." 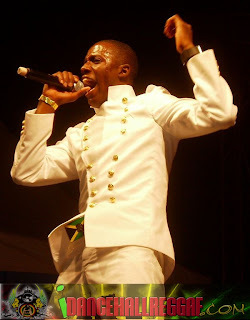 In just a few weeks, on June 8, the singer will be releasing his self-entitled debut album on the VP Records label.